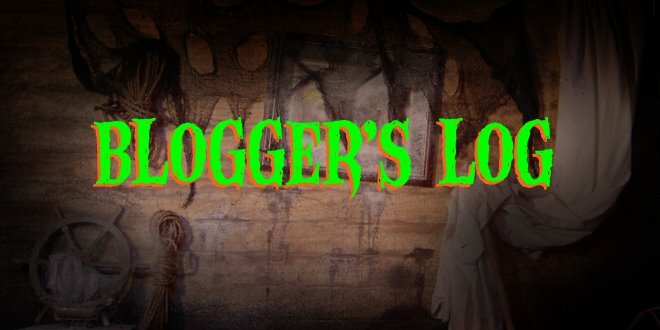 Believe me when I tell you that no one is more mortified than me that we are not posting a Halloween Special this year. It is extremely disappointing. A script was written, props were made, but unfortunately, we could pull all of our resources together so get something in front of camera. We dropped the ball. Okay, I dropped the ball. Halloween is such a unique time of year and as I've told my family, this is the time of year when the creative well is filled. Although Autumn is traditionally the time of harvest, for me it is the time of planting. A time of renewal and inspiration. This year has been no exception. Call it inspiration, afflatus, the eureka response, however you want to refer to it, know that it has permeated my creative soul and I'm ready to go back to work. Yes, much has suffered this month: my first person monster blog, my weekly column on film school rejects and my dear, dear Phantom Harbor. 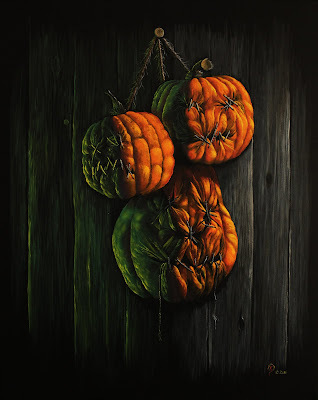 However on the other side of the scales: I've been writing a draft of Rick Baker's book that is due out next yeair, I sold two paintings in the October Shadows art show (the one pictured here is entitled "Shrumpkin Heads"), and I have made two new Pumpkin Peek-A-Boos! Hopefully, I'll get them licensed before the end of 2011 and they'll be on shelves in 2012. So, now that things are quieting down, and I need to find a real (reel) job, perhaps now I'll be able to fulfill my obligations to Phantom Harbor and all of you. Again, I appreciate your patience, interest and support. AND...I'll try to make a Halloween Special NEXT year that will be amazing. Anyone who thinks that they may want to play a monster, and lives in Los Angeles, NOW is the time to speak up!